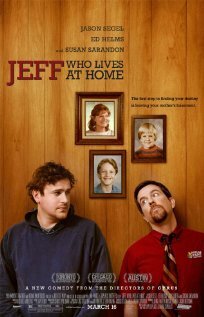 Jeff, Who Lives at Home follows life in the day of Jeff (Jason Segal), his brother Pat (Ed Helms), and his mother Sharon (Susan Sarandon). Jeff believes that all of our lives are intertwined, and lives his life making choices based on the signs he sees every day. His brother has little time for this though, and believes Jeff has his priorities wrong. However, as a nightmarish day unfolds, all paths lead to one place. Segel proves his capability as a comic actor, yet he plays Jeff with a sincerity that lesser actors could not manage. This is why the film is able to shift seamlessly between comedic moments, and the more profound. The relationship between Jeff and Pat shifts believably, as they begin to understand what is important to one another, with well-written exchanges such as that at their Father's grave, and in the bath of the hotel room. All this is played against a day in Sharon's office, as she discovers she has a secret admirer. This plot line ends with what may be one of the most romantic moments I've seen in any film recently. It is a story about discovering what's important, about remembering who we love, and about the meaning we derive from our lives. I just wanted to shout about how much I enjoyed it, and how much it moved me. It is a film that makes you feel glad of this life.